That is, this script automatically creates a german version of the diagram. 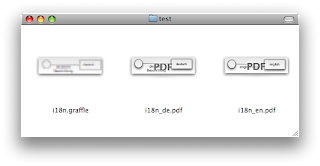 I have a script for each language (and one w/o i18n) in my script folder, e.g. After applying the both i18n-scripts to the diagram, two PDFs are created from my diagram: This technique works pretty well with text and connection labels. 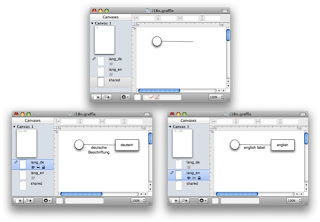 Unfortunately labels placed on shapes cannot be moved on a layer different from the shape. So, in these cases you have to move the whole shape to the language layer. If you translate a diagram after you have created it, this works pretty well. It may become a little bit annoying if you have to change the diagram, but at least you are aware of the changes and don't have to work with two separate files.